The piezoelectric materials that inhabit everything from our cell phones to musical greeting cards may be getting an upgrade thanks to work discussed in the journal Nature Materials released online Jan 21. Xiaoyu 'Rayne' Zheng, assistant professor of mechanical engineering in the College of Engineering, and a member of the Macromolecules Innovation Institute, and his team have developed methods to 3-D print piezoelectric materials that can be custom-designed to convert movement, impact and stress from any directions to electrical energy. "Piezoelectric materials convert strain and stress into electric charges," Zheng explained. The piezoelectric materials come in only a few defined shapes and are made of brittle crystal and ceramic—the kind that require a clean room to manufacture. Zheng's team has developed a technique to 3-D print these materials so they are not restricted by shape or size. 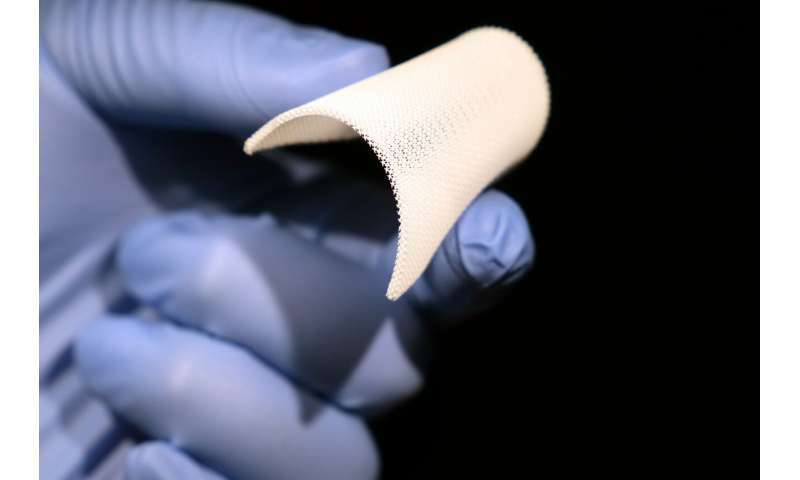 The material can also be activated—providing the next generation of intelligent infrastructures and smart materials for tactile sensing, impact and vibration monitoring, energy harvesting, and other applications. Piezoelectric materials were originally discovered in the 19th century. Since then the advances in manufacturing technology has led to the requirement of clean-rooms and a complex procedure that produces films and blocks which are connected to electronics after machining. The expensive process and the inherent brittleness of the material, has limited the ability to maximize the material's potential. Zheng's team developed a model that allows them to manipulate and design arbitrary piezoelectric constants, resulting in the material generating electric charge movement in response to incoming forces and vibrations from any direction, via a set of 3-D printable topologies. Unlike conventional piezoelectrics where electric charge movements are prescribed by the intrinsic crystals, the new method allows users to prescribe and program voltage responses to be magnified, reversed or suppressed in any direction. "We have developed a design method and printing platform to freely design the sensitivity and operational modes of piezoelectric materials," Zheng said. "By programming the 3-D active topology, you can achieve pretty much any combination of piezoelectric coefficients within a material, and use them as transducers and sensors that are not only flexible and strong, but also respond to pressure, vibrations and impacts via electric signals that tell the location, magnitude and direction of the impacts within any location of these materials." A factor in current piezoelectric fabrication is the natural crystal used. At the atomic level, the orientation of atoms are fixed. Zheng's team has produced a substitute that mimics the crystal but allows for the lattice orientation to be altered by design. "We have synthesized a class of highly sensitive piezoelectric inks that can be sculpted into complex three-dimensional features with ultraviolet light. The inks contain highly concentrated piezoelectric nanocrystals bonded with UV-sensitive gels, which form a solution—a milky mixture like melted crystal—that we print with a high-resolution digital light 3-D printer," Zheng said. 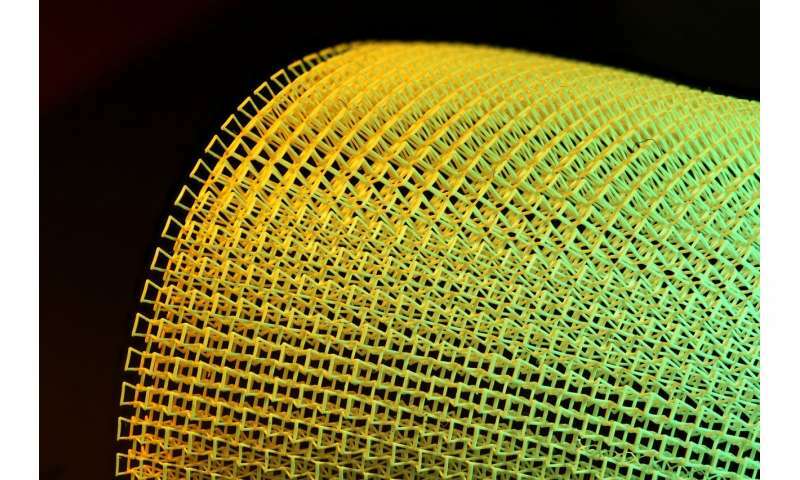 The team demonstrated the 3-D printed materials at a scale measuring fractions of the diameter of a human hair. "We can tailor the architecture to make them more flexible and use them, for instance, as energy harvesting devices, wrapping them around any arbitrary curvature," Zheng said. "We can make them thick, and light, stiff or energy-absorbing." The material has sensitivities 5-fold higher than flexible piezoelectric polymers. The stiffness and shape of the material can be tuned and produced as a thin sheet resembling a strip of gauze, or as a stiff block. "We have a team making them into wearable devices, like rings, insoles, and fitting them into a boxing glove where we will be able to record impact forces and monitor the health of the user," said Zheng. "The ability to achieve the desired mechanical, electrical and thermal properties will significantly reduce the time and effort needed to develop practical materials," said Shashank Priya, associate VP for research at Penn State and former professor of mechanical engineering at Virginia Tech. The team has printed and demonstrated smart materials wrapped around curved surfaces, worn on hands and fingers to convert motion, and harvest the mechanical energy, but the applications go well beyond wearables and consumer electronics. Zheng sees the technology as a leap into robotics, energy harvesting, tactile sensing and intelligent infrastructure, where a structure is made entirely with piezoelectric material, sensing impacts, vibrations and motions, and allowing for those to be monitored and located. The team has printed a small smart bridge to demonstrate its applicability to sensing the locations of dropping impacts, as well as its magnitude, while robust enough to absorb the impact energy. The team also demonstrated their application of a smart transducer that converts underwater vibration signals to electric voltages. "Traditionally, if you wanted to monitor the internal strength of a structure, you would need to have a lot of individual sensors placed all over the structure, each with a number of leads and connectors," said Huachen Cui, a doctoral student with Zheng and first author of the Nature Materials paper. "Here, the structure itself is the sensor—it can monitor itself." Haptics gloves for enhanced manipulation of micro-scale objects suggest themselves, as well as the functional architecture of muscle-like robotic articulation for more human-like personal helpers for disabled individuals.